Many thanks, that is a brilliant website that I will spend some time enjoying. It didnt answer the question though by simply displaying grey trousers as I would find fault in most of the colours displayed. not both bed rolls then what are they "overcoat"? Last edited by General Brock; 23 Jan 14, 22:30.
just blue "so I thought" then came grey...???Hmmm. If they had of followed the typical then they would have had the edging in the facing colour like the light dragoons. This would have been red but that was used by the foot artillery so it seems they wanted to be different and used yellow. By the way, it was a valise not a blanket roll, though again if your valise is damaged or never issued then you put all your goodies into a blanket and roll it up placing it where your valise should go. If not a blanket then your coat. Hard to believe the arguments this sort of thing can cause considering the wide variation from what was supposed to be. 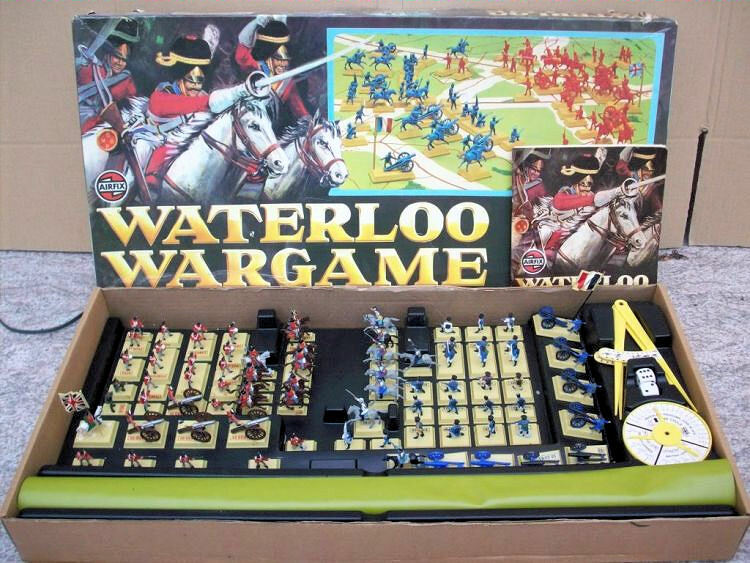 That brings back memories... Airfix from the dawn of time! I'll PM some pictorial and printed info to you. The valise behind the team rider is blue edged yellow which is as per regulations. The saddle blanket is supposed to be blue but it reality could be any colour and the personnel's blanket role (which could also be the riders great coat) strapped to the off side team horses was probably blue but could also be brown or grey. I would paint it blue. Last edited by Nappyfan; 13 Jul 12, 22:14. I am having trouble deciding what color to paint British Line Infantry trousers circa 1815. I remember one ref saying that some of the units wore summer white (Waterloo was in summer) like in Spain, the tropics and at home. Others say blue-grey without a second thought as to what that is. Going by what officers wore, which was more blue than grey, perhaps a new set of trousers for the soldier were also this color? Bl$@dy Hell! - I wish I owned THAT!!!!! What a wonderfully tempting find, General Brock, I'd better stop a-droolin' or my keyboard'll blow up, and the Library'll NOT like THAT!!!!!!! And Nappyfan, British Infantry trousers for "Waterloo Period" are a very confusing subject. Most books I've read state a "bluey-grey" colour for rank & file. But some illustrations show even a brownish colour in their trousers! To be honest, most people I've talked to, or books that I have read, state "Grey" trousers for the rank & file, as well as officers, and most Wargamers I know generally follow this rule. I hope this information is of some small help to you, my friend. Last edited by 95th Rifles; 23 Jul 12, 08:01.
due to the weave pattern. It was popular when units returned back to Britain. After Waterloo, black and dark blue eventually became common at various times up to and into the Victorian era. that had a distinct blueish tinge. Were they wearing new trousers? Some regulations prior to the Waterloo period state blue for officers. Could we take the blue grey at face value and oaint wargame figures a mid to dark blue grey? considering units would have been re-equipped whilst in Britain. so contemporary drawings may not be much help. I think I will make up a shade of blue grey, tending towards a dark grey. Oh and thanks, Dibble, I will do the guards in home white. As far as I can see from my reading, at the start of the Napoleonic period, regulations were that regiments of infantry were to wear white legwear, buff being worn by buff-faced units. 1812 regulations stated a more widespread shift to blue-grey (in my illustrations I've been using the Letraset Promarker "Cool Grey 4", I believe), and white (often linen) in the summer/tropics. But many units still wore white or buff by 1815, as regulations always seemed to take some time to come into effect. (As an example, new 1812-reg Belgic shakos took a number of years to reach some battalions, and few in the tropics received their white 1812 Belgics, as they were abandoned and phased out before they'd even arrived). And officers often made up their own rules as they liked to appear a bit spiffy. I've seen illustrations and portraits of officers in navy or dark blue legwear too - trousers/overalls/even a few breeches too. The few old highland regiments which retained Highland status by 1815 show evidence of some of their officers wearing regimental trews. Officers of Rifles seem to vary from greens, browns, greys, often with different shapes of leather inserts in browns, greys and black. So I think it's up to you really! Vary it, mix & match. Officers seemed to rather mix it up with all sorts of headwear, sashes, belts, customised wings and epaulettes, footwear, cloaks, overcoats & weaponry. Some officers of the 43rd even adopted light grey, or red pelisses. I read one account of one junior officer who spent so much on his uniforms that when captured by the French, he was believed to be a much higher ranked officer. Some peacocks really kept their tailors busily employed. And of course, all ranks, officers and men had to put up with shortages in equipment and clothing, and the hardships of campaigning. But I know that you know that I know that you know that. Last edited by Lone Stoat; 29 Jul 12, 19:17. All times are GMT-5. This page was generated at 15:23.